Insider Series: How Are Major Airlines' Pilots Trained? Insider Series: How Are Major Airlines’ Pilots Trained? Brand new to our Insider Series, where travel-industry professionals write about their work under pseudonyms, TPG Contributor “Marty McFly” is a pilot for a major American airline who has agreed to share how airline pilots are chosen and trained to fly the big birds. Have you ever thought about how complex an endeavor each airline flight really is? You’re riding in a machine that often weighs more than half a million pounds, carrying tens of thousands of gallons of fuel, in an environment that — without a thin layer of steel around you — isn’t particularly life-sustaining. And yet there you are, watching a movie, finishing a PowerPoint or catching up on some sleep without a second thought. Your peace of mind is due to the incredible safety record of the airline industry, both domestically and abroad, that can be attributed to all the dispatchers, maintenance technicians, flight attendants, air traffic controllers, pilots and many others who work together every day to ensure you an uneventful flight. Your pilots, in particular, have undergone rigorous training to operate your aircraft with all manner of malfunctions in all possible weather, in every part of the world. A pilot hired by a major airline has generally flown thousands of hours for regional airlines (or the military) already. Photo courtesy of Shutterstock. The major US airlines (e.g., Delta, American, United, Southwest, Alaska, etc.) have the luxury of picking from well-educated, seasoned and certified pilots who have already flown thousands of hours for regional airlines or the military. Major airlines’ training departments don’t take that experience for granted, but all new-hire pilots still have to undergo thorough training on not their new employer’s airplanes, policies and procedures. Oftentimes, this training lasts for two or more weeks before a new hire starts their aircraft-specific training. The first major phase of a major-airline pilot’s training is learning what everything in the cockpit actually *does. * Photo courtesy of Shutterstock. Phase One: Systems Class. This is when the pilot learns what every switch, knob and dial in a particular cockpit actually does, as well as how the numerous aircraft systems work in both normal operations and emergency situations. At the conclusion of this phase, there’s an oral or written test they must pass to continue on. For new-hire pilots, this can be a make or break exam, but for established pilots with the airline that are training for a new aircraft, there is the opportunity to receive additional training until they can successfully proceed through the program. Phase Two: Learning Aircraft-Specific Procedures. In this stage of training, the pilot learns how to prepare the aircraft for each phase of flight – from initial cockpit setup to parking at the end of the flight. The pilot will learn numerous procedures that he or she must know from memory before proceeding, and these checklists that pilots perform are designed to confirm that the most important of those steps has been performed correctly. For example, to properly pre-flight a 777, there are more than 200 individual switches that must be configured and tests that must be performed before the engines are even started. At the end of this phase of training, there’s a practical exam in either a full-motion or stationary cockpit simulator that determines if the pilot can perform all of these normal tasks before moving on to the actual flying part of training. Inside the simulator. Photo courtesy of Shutterstock. Phase Three: Flight Simulator. Flight simulators used by major airlines in training have been certified to properly simulate the flight characteristics of a particular aircraft. 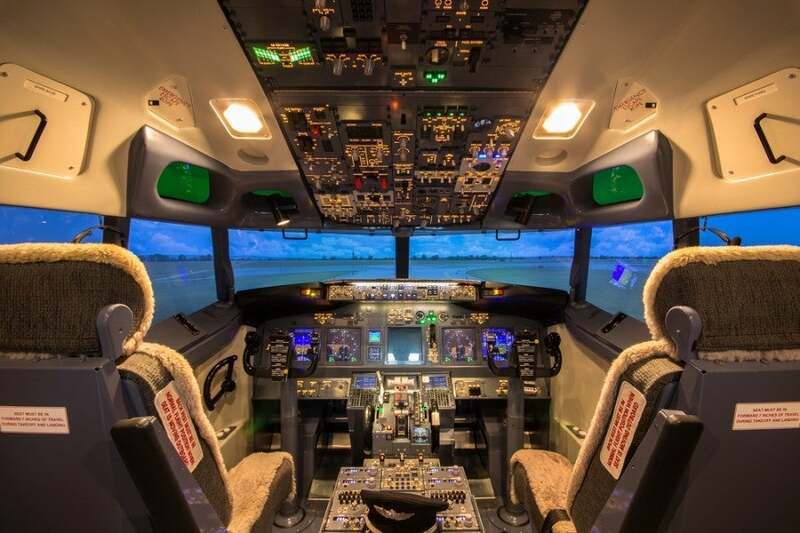 Simulators are exact replicas of the aircraft cockpit and have state-of-the-art visuals that create an incredible level of reality for students. There are usually only one or two sessions where the sim (short for simulator) is flown without malfunctions. In this phase, the pilot learns: 1) to fly the aircraft in every extreme of its operating envelope, and 2) how to deal with a seemingly endless string of emergencies. The best way to describe these sim sessions would be, “It’s always dark, the weather is always bad and something is always on fire.” At the end of this phase, new-hire pilots are given another practical exam where they must successfully deal with engine failures and other malfunctions and safely get the aircraft back on the ground in bad weather. 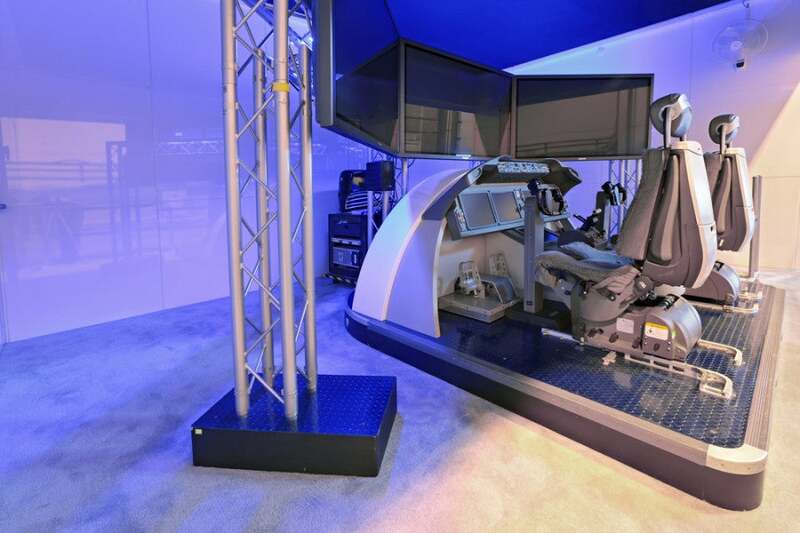 A large-scale flight simulator used to train pilots how to fly in real-time situations. Photo courtesy of Shutterstock. Phase Four: Real-Time Flights in the Simulator. During the last phase of their training, pilots will fly a number of “normal” flights in the sim, performing all of their tasks in real time. This means that the instructor will push the pilots to perform their tasks in a timely manner so they’ll be able to operate the aircraft in actual line operations. 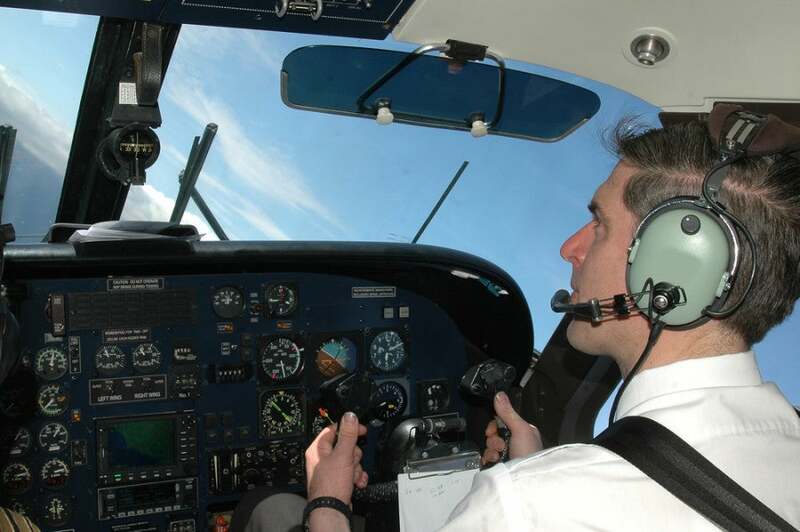 At this point in pilot training, an instructor will give minimal instruction, and instead will focus on monitoring performance and determining if the pilot is ready for his or her final checkride. These sims will be “flown” in all regions of the world in which the pilots will be required to operate once they’ve completed school. The pilots will focus on the rules and regulations of each region and how they differ with domestic operations. These particular sims always end in an emergency situation that will force the pilots to pick an appropriate airport to divert to and safely land. 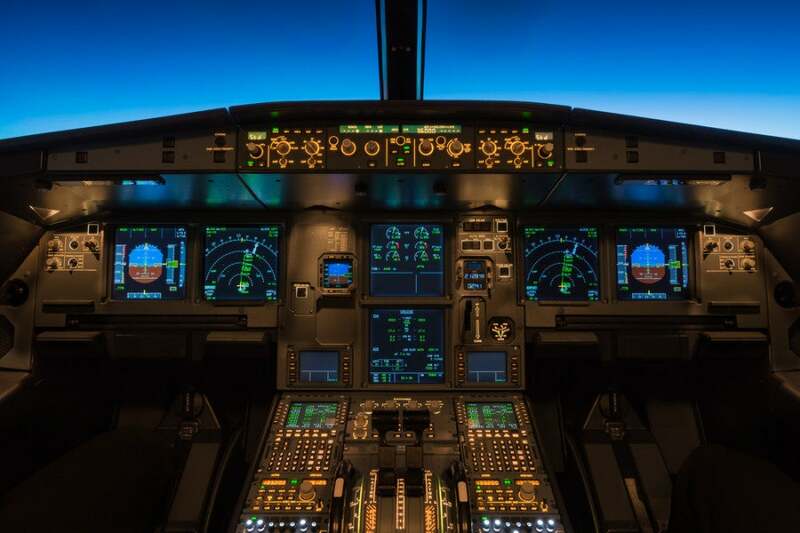 At the end of this phase, the pilots will take their final exam in a simulator in the presence of an airline examiner who has either been approved or employed by the FAA. Upon the successful completion of this final exam, each pilot will be sent to continue his or her training with a check pilot in the actual aircraft — with passengers on board for a scheduled revenue flight. Fortunately, as a freshly-trained pilot, you’re so spring-loaded for an emergency that it actually takes a few flights before you start to trust the airplane will operate normally just about all of the time. 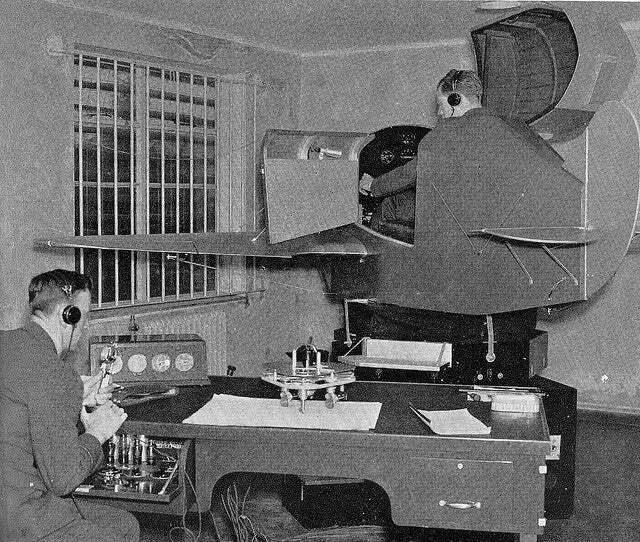 Simulator training is a lot different these days than it was in the 1950s. Photo courtesy of RAF Link Trainer / Flickr. In addition to these four phases of initial aircraft training, commercial pilots have to go back to the training center for recurrent training every nine or 12 months. They’ll be given oral and practical exams in the simulator to ensure that they’ve maintained their proficiency, and will be brought up to speed on changes that are coming to the airline and fleet. These recurrent training events are jeopardy events that, if not passed, could result in remedial instruction or, in some cases, termination. There are also frequent additional training opportunities that the pilot must accomplish on his or her off time to stay up to date on policy, procedures and changes to their aircraft and the airline. This thorough training process and its focus on strict adherence to the airline’s standard operating procedures is what allows pilots who have never met to safely operate aircraft in a very complex airspace, challenging weather and in very rare instances, handle emergencies without making the headlines. When you hear about pilots getting damaged aircraft safely on the ground, it’s years of hard training — and not luck — that prepared them for that event.